At The Journey, we believe that life is a team sport – best done together! 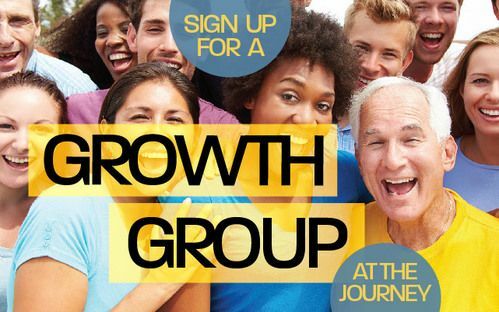 Growth Groups are The Journey's groups of 15-20 people who get together each week in a convenient South Florida location. Growth Groups are about sharing life together as we build authentic relationships, grow in faith, and do ministry together. Plus, Growth Groups only meet for 1 hour a week for 12 weeks, so they are a short-term commitment with lasting impact! Spring 2019 Growth Groups are closed, BUT Summer 2019 Growth Group sign-ups will begin on Wednesday, May 5, 2019! Don’t worry, Growth Groups aren’t designed to eat up your schedule. Your Group will meet once a week for 60 to 90 minutes for 12 weeks. Look around at a Sunday service… A Growth Group is basically 15 or so people who get together once a week to discuss the topic you have chosen. How can I be sure that there is a Growth Group for me? Convenient locations close to your work or home matter, so Groups are offered all over the South Palm Beach and North Broward County areas. Once you sign up, the Group Leader will contact you with the specific address of the Group’s meeting place. A variety of Groups allows you to choose your topic to study, along with those who share life experiences similar to yours. Growth Groups study a variety of books and topics that are intended to help you grow in your faith and in your understanding of the Bible. Each group selects the book that they would like to study during the semester so find a topic that fits your interest. Your Growth Group leader is a regular person just like you that attends and serves at The Journey! Many of our Group Leaders are long-time group members who love helping people like you get connected into a great group! or at any Sunday service on your connection card. If you have any questions, email [email protected] or call 561-420-0606 x310. Whether it’s watching a movie, bowling a couple of games, cooking out or going to the beach… it’s an easy way to check out The Journey, meet new people, and just enjoy a good time together. To see a list of upcoming events, click here. If you have questions, feel free to contact Pastor Jason Hatley ([email protected] or 561-420-0606 x310).